Mmmm…messy. Get out the napkins! Here’s another way to use up some beer, if you ever find you have leftovers. I waxed eloquently (or not so eloquently) about beer in my last post about bread. I always try to buy ribs when they’re on sale. When they’re not on sale they can be prohibitively expensive. Like everything else, I guess. Thank goodness for our garden, because on Saturday I refused to buy any of the grocery’s veggies. Very over-priced. For example, red peppers were over $4/lb. I know they’re out of season, but still... The green peppers were $1.69/lb and were all gone (of course). Greens like chard and kale were inching toward $4/bunch as well. So it’s best to shop the sales whenever you can and save yourself some cash. And if you have room get a small chest freezer. You can pick up deals on meat, chicken and fish and keep them for later. If you do so, you may be able to buy some of those disgustingly priced vegetables. You know, the ones we need to eat to have a balanced diet. Ribs, if you don’t know, are a two-stage cooking affair. You have to boil them before covering in sauce and finishing. This is true for other ribs as well. 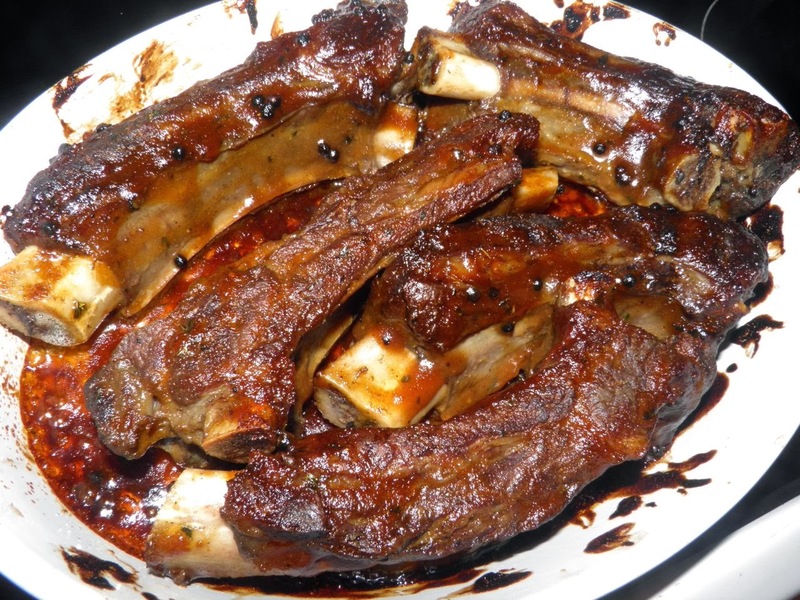 Simmering in liquid (like beer or fruit juice) cooks and tenderizes the ribs so when you barbecue, bake or broil all you need to do is brown the sauce. 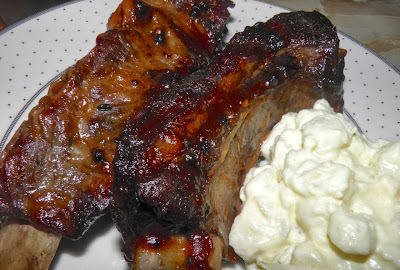 Most rib sauces are high in sugar, so if you cook long enough to cook the meat you end up burning the outside. It’s hard enough to not burn them even when pre-boiled. Keep a close check while they cook. That’s why this recipe is baked, as opposed to broiled or on the BBQ. It’s a little easier to control. It had something to do with the weather, too. 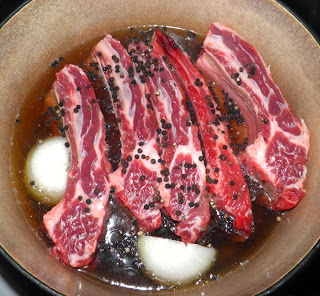 Cut the beef ribs into serving pieces, leaving equal amounts of meat on each rib. Place in a pot and add the beer and salt. Bring to a boil, cover, reduce heat to medium and let cook for 1 hour. Meanwhile mix the wet rub ingredients together in a small pot. Bring to a boil and let cook for about a minute until thickened and glossy. Let cool. 15 minutes before the ribs are done, preheat the oven to 375°F. Drain the ribs and place in a baking dish big enough to hold them in one layer. Pour the rub over the ribs and use your hands to coat well. 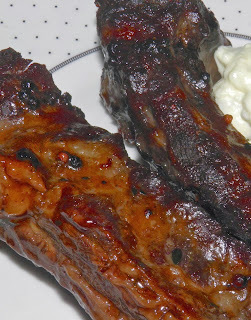 Bake the ribs for 30 minutes, until the sauce is bubbling on top of the meat. Serve with potato salad.